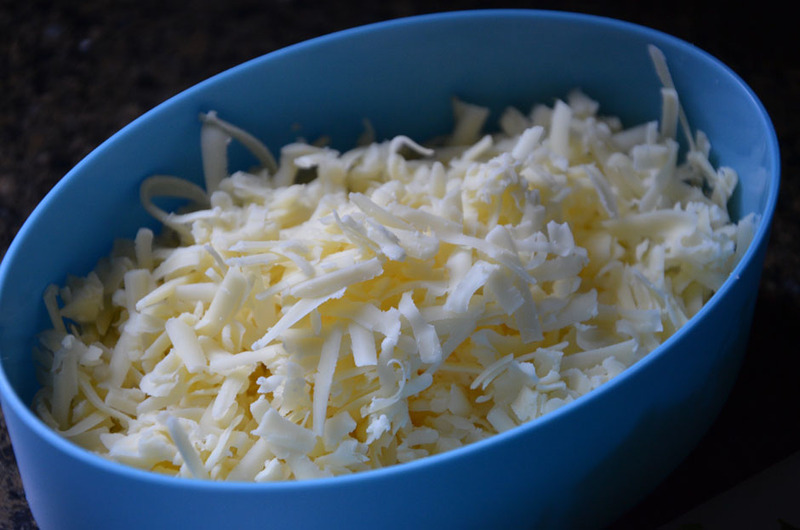 This isn’t a glamorous dish with fancy ingredients … it’s an accidental recipe (and I use ‘recipe’ loosely) that occurred one evening when I forgot to plan dinner. It had been a long day and we were all in need of some comfort food. I remember standing in the light of the open refrigerator and staring for who knows how long. 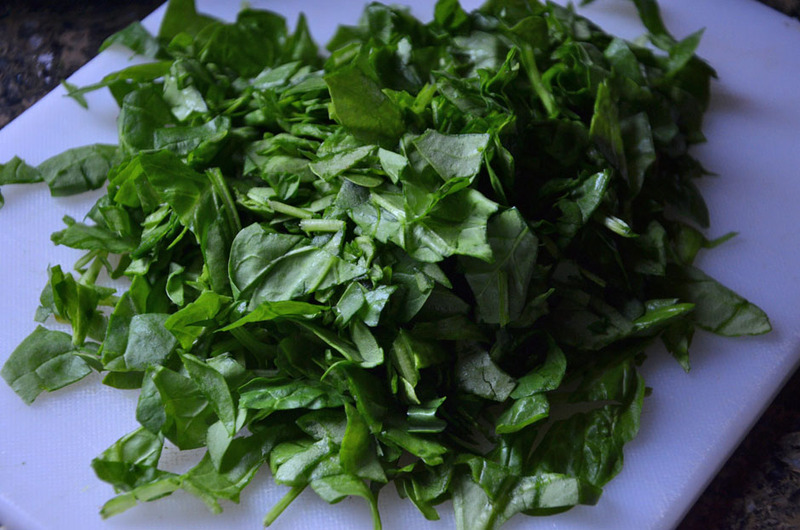 Finally I pulled out my favorite standby ingredients: fresh baby spinach (now whatever I make will be healthy! ), cheese and a pound of ground sausage. I took the same stance at the pantry door … no, I don’t want rice. No, I don’t want spaghetti. It was a random eureka moment that turned into a tasty dish for the dinner table. And it was delicious, by the way — very comforting and belly-filling. So grab these hodge podge ingredients, or try your own tasty twist and let me know how dinner turns out for you! STEP ONE: Finely chop two cloves of garlic and fresh spinach leaves. I grabbed two heaping handfuls of spinach (about 2 1/2 cups chopped). Saute garlic in a tablespoon of olive oil for a minute or two. Then add 1 lb. of ground sausage to the pan. Boil water for pasta and be sure to add salt to the water. STEP THREE: Brown ground sausage in a skillet with garlic. While sausage cooks, add 1 lb. of orzo pasta to boiling water and cook as directed on the package. 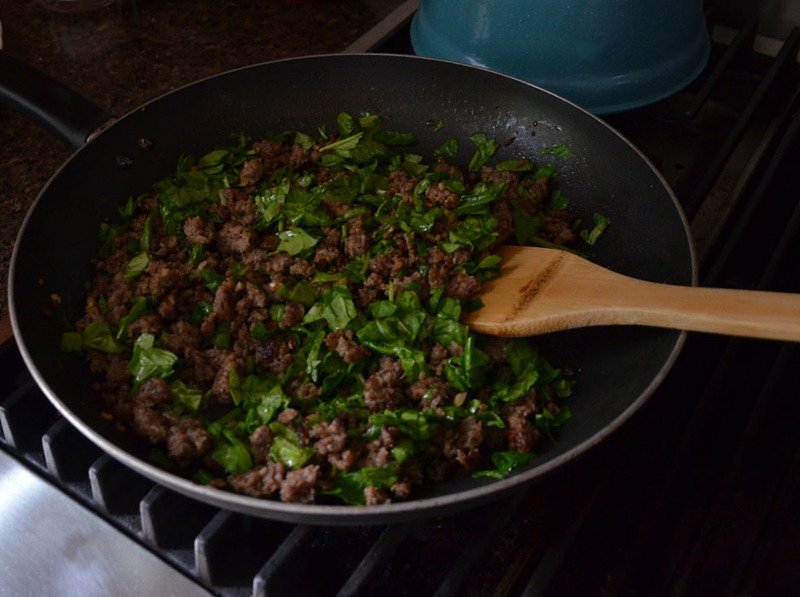 When sausage begins to brown, add chopped spinach and saute on medium-high heat for another minute. Add about a cup of wine (I used Twigg Winery White Table Wine) to the skillet to deglaze the pan. Then, turn heat to medium low and allow the wine to reduce by half (6-8 minutes). Much of the alcohol will evaporate during this time, too — not all, but a good bit. STEP FOUR: Add a tablespoon of butter and 1/2 cup of heavy cream to the sausage mixture. Salt and pepper to taste. Stir to combine and simmer for about five minutes. STEP FIVE: Drain pasta and return to its pot. Don’t worry if your sauce isn’t yet finished. Just add a healthy drizzle of olive oil to the pasta and gently stir. That will keep it from sticking and clumping. 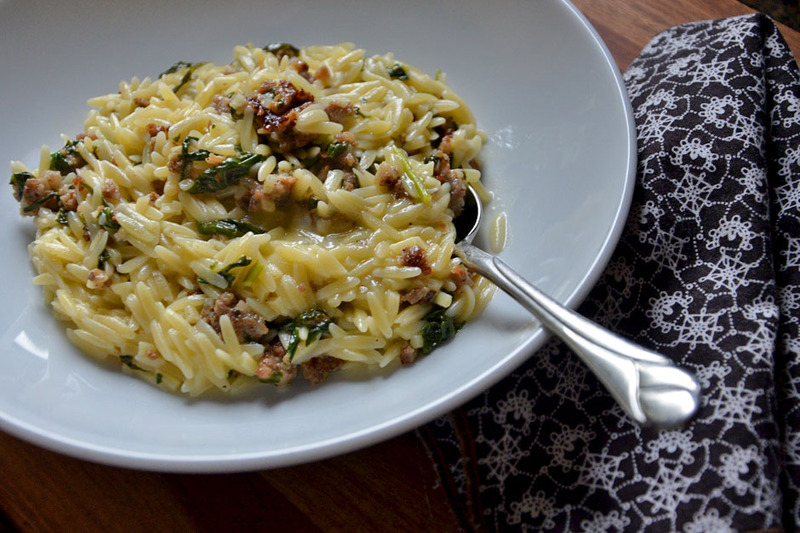 When your sausage spinach sauce is thickened a bit, add 1 cup of freshly shredded Cabot Sharp Cheddar cheese. Stir until melted. Then pour sausage mixture over the pasta. Gently combine. The final step is to serve this delectable dish to your people. And here’s another suggestion for total comfort food bliss: serve brownies for dessert. They’re perfect with this meal, trust me! 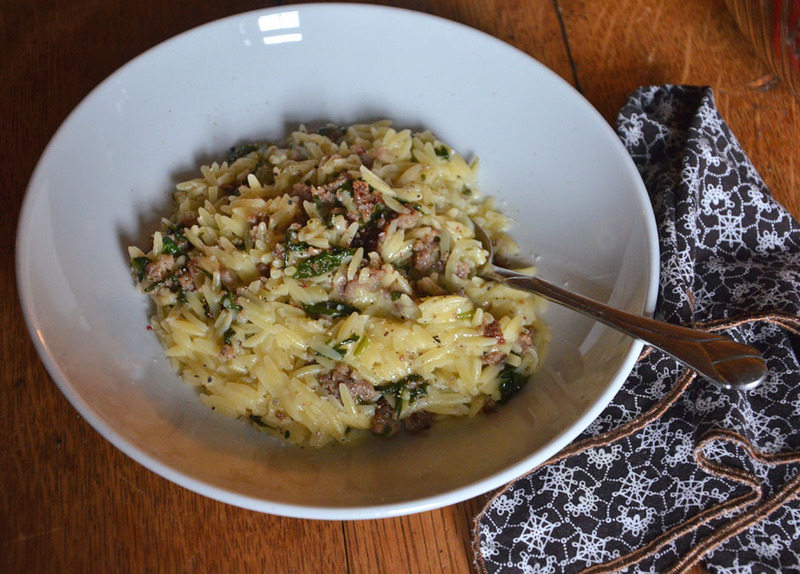 So there you have it … an accidental dinner combining a few of my favorite ingredients. I think those are often the best kind of meals, too — random ingredients, tossed together in a tasty way. It’s like not coloring between the lines, or having an aversion to following directions. We’ll call it ‘creative and whimsical’ … you know the type.